"Thutmose escaped from all the pomp & pagenatry to hunt on the edge of the desert"One day, when the court was in residence at Memphis for the great festival of Re at Heliopolis a few miles further down the Nile, Thutmose escaped from all the pomp and pageantry to hunt on the edge of the desert. He took with him only two servants, and he drove his own chariot up the steep road past Saqqara where the great Step Pyramid of Djoser stands, and away through the scrub and stunted trees where the cultivated land by the Nile faded into the stony waste and the stretches of sand and rock of the great Libyan desert. During the long centuries since Khafra had been laid to rest in his pyramid the sands of the desert had blown against the Sphinx until it was almost buried. 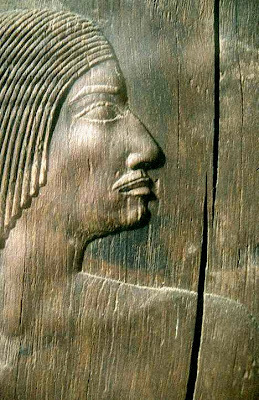 Thutmose could see no more than its head and shoulders, and a little ridge in the desert to mark the line of its back. For a long while he stood looking up into the majestic face of the Sphinx, crowned with the royal crown of Egypt that had the cobra's head on its brow and which held in place the folds of embroidered linen which kept the sun from head and neck - only here the folds were of stone and only the head of the serpent fitted onto the carved rock was of gold. 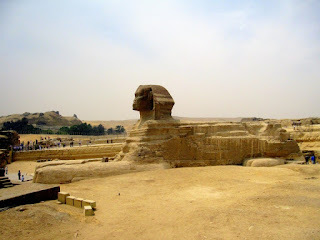 "...he gazed up at the Sphinx & prayed to Hermachis for help in all his troubles. "The noonday sun beat mercilessly down upon Thutmose as he gazed up at the Sphinx and prayed to Harmachis for help in all his troubles. 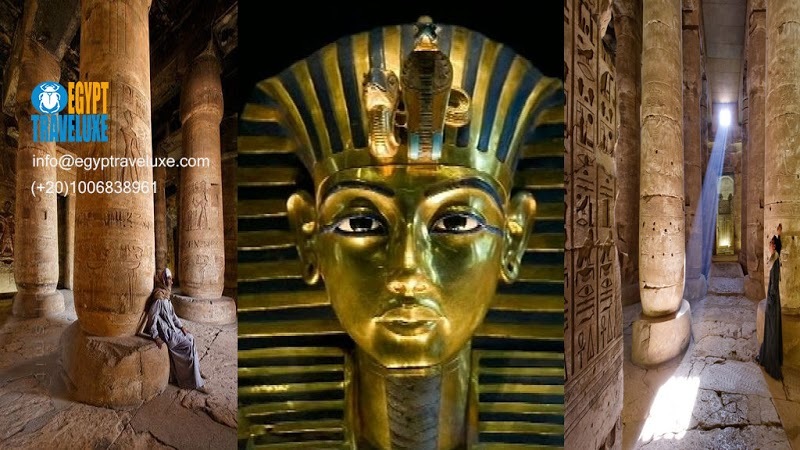 The Afterward .Just a hundred and fifty years ago - 3,230 years after Thutmose IV became Pharaoh of Egypt - the Sphinx, again buried to the neck in sand, was dug out by an early archaeologist. Between its paws he found the remains of a shrine in which stood a red granite tablet fourteen feet high. Inscribed on it in hieroglyphs was the whole story of the Prince and the Sphinx. 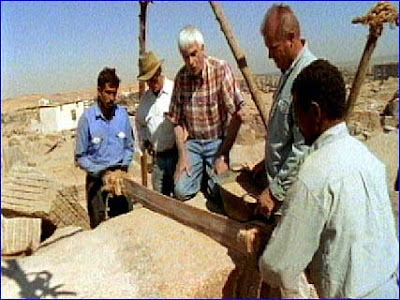 The tablet also tells us that it was set there in fulfillment of his vow by Pharaoh Thutmose IV in the third month of the first year of his reign, after he had cleared away all the sand which hid from sight Harmachis, the great Sphinx that had been made in the days of Khafra, when the world was young.